Zoombezi Bay opened in May, 2008 for the first time and offers an amazing experience for members and guests at this premier regional entertainment destination. 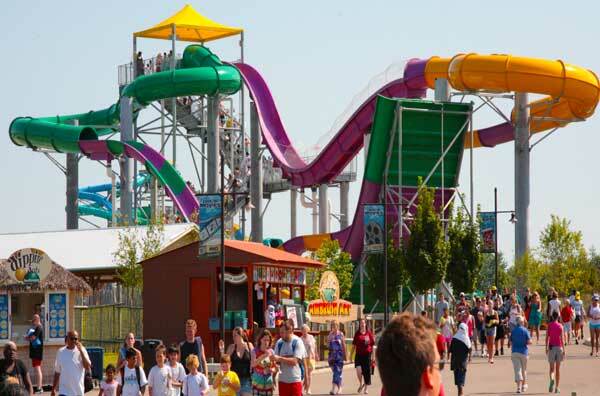 The brand new 22.7 acre water park replaced the former Wyandot Lake water park with all new rides including 15 state-of-the-art water slides, rivers, cabanas and a wave pool. Several of the old non-water rides from the Wyandot Lake water park have been restored to their original glory including the 52 year old Sea Dragon roller coaster. These rides are not part of the general admission to the water park and will require pay-as-you-ride tickets. Those familiar with the old Columbus Zoo and Aquarium will note that as part of the zoo’s expansion, its entrance has been changed. Instead of entering from Riverside Drive, visitors will be directed to 2 new entrances on Powell Road, which has been rerouted to loop south of the zoo property. 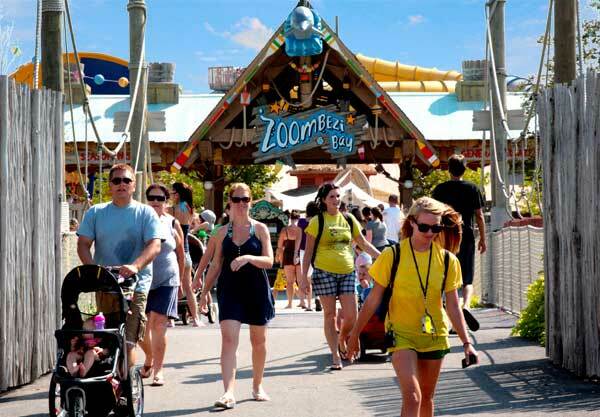 The Columbus Zoo and Aquarium purchased Wyandot Lake from Six Flags in 2006 for an estimated $2,000,000 and an additional $20,000,000 worth of renovation to the property. Take on 1 of 7 different waves at this 544,500-gallon wave pool with a maximum depth of 6'. Waves can reach up-to 4' high. Adults can take a ride on the lazy side in this adult-only lazy river containing 203,000 gallons of water, 850' in length, and just a little under 32" in depth. With 9 special features, the action river is sure to surprise guests at every turn. Over 570,000 gallons of water roar 1,500' at 32" deep and an average of 17' wide. Come and play in this 18,000-square-foot custom pool divided into 3 interactive play areas, including a 4.5 story tree house with a 100 different gadgets, gizmos and slides. Watch out for the large barrel that is overhead! This barrel dumps 500 gallons of water every few minutes on all who dare to visit Barracuda Bay. Guests must be 36" tall to enter or accompanied by an adult. An area just for the little tykes, this 4,000 sq. ft. water playground features 12 marine animal play structures and includes an 11,350 gallon pool that is 12" - 14" deep. This tower is home to the Slippery Seals, Sea Snakes and Sea Tubes. No need for a raft on these three body slides! Starting from a 63' tall tower, guests slide thru the 310' slide containing portions that are enclosed in darkness. Guests must be 48" tall to ride. 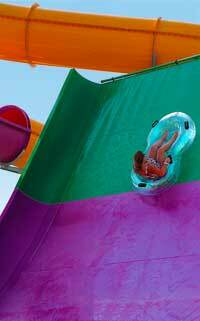 Two 1- or 2-person raft slides starting from a 51' tower challenge riders for 200' with the premier attraction being a bowl shaped slide section where the rider slides around the side of the bowl in a circular motion. Guests will be required to transport rafts on their own. Guests must be 48" tall to ride. Plummeting on a 1- or 2- person raft from 51', guests experience the many challenges that the Sea tube offers including a portion of the slide enclosed in darkness. Visitors will be required to transport rafts on their own. Guests must be 48" tall to ride. Dropping from a 55' start to reach unmatched speeds of 20 mph, this extreme 4-person raft cruises into the largest enclosed reducing -radius tunnel in the world. This is sure to be the most exciting and popular ride in the park. The Cyclone stretches 209' in length. Raft transport is complimentary and starts from the same tower as the Tahitian Twister. Guests must be 48" tall to ride. Bring the whole family and start from 55' in the air on a 5-person raft to experience a journey in total darkness through a series of acceleration drops, vortex loops, back to back curves and a 360 degree turn before arriving in the pool below. The slide is 512' in length. Raft transport is complimentary and starts from the same tower as the Cyclone. Guests must be 48" tall to ride or at least 42" tall and accompanied by an adult. Starting from a 49' tower, up-to 6 guests can compete in this head-first, mat racing, high speed attraction. This slide has a length of 310' and is longer than a football field. Guests must be 42" tall to ride.